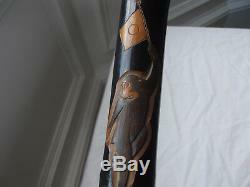 This carved laquered walking cane with hidden fishing rod obviously commemorates the "Anglo-Japanese Military Alliance" which was signed in 1902, ran throughout WW1 and stopped in 1921. Despite searching everywhere, I cannot find another like it! 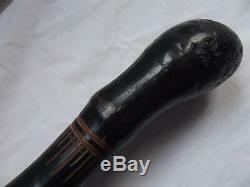 The black laquered cane is particularly well carved with (from the top down). 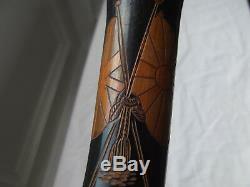 Root handle with carved design around neck. Some of the original colour on the flags remains but is a bit faded. A monkey (macaque) waving a small Japanese flag over his head. 2 cherries on a branch with leaves. 2 beautifully carved monkeys in humorous poses. 3 cherries on branch with leaves. 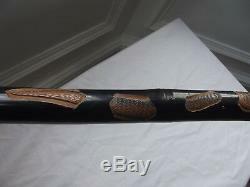 An open mouthed snake with forked tongue carved in sections as if winding in & out of cane. 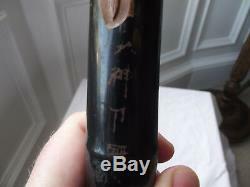 What appears to be a japanese character signature scratched into the black laquer (photo 7). Length of walking stick approx. 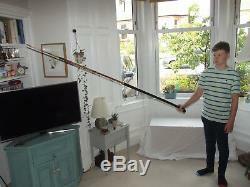 Length of stick with fishing rod extended approx. 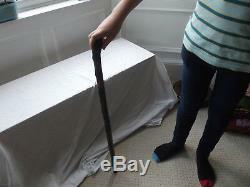 The walking stick is in very good strong & sturdy condition. 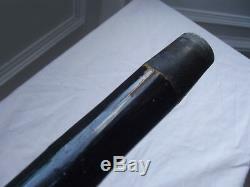 It has the original metal ferrule (end cap) which has signs of wear/denting but is reasonably tight fitting. The black laquer work is more than 90% complete with a few scratches and marks. The cane has some very minor splitting at the ferrule end the most obvious one is approx. 2 long but still tight and secure. The internal fishing rod/cane comes out smoothly in 2 sections. The first section is approx. 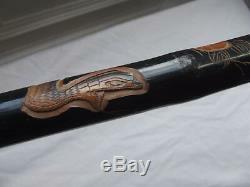 2' long and is in very good condition, the 2nd section has unfortunately had its tip broken off and is approx. 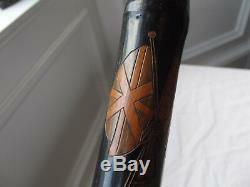 A very rare piece - possibly presented to a senior Royal Naval Officer by his Japanese equivalent. Will be sent very strongly packaged (in indestructible tube) by insured & tracked post. 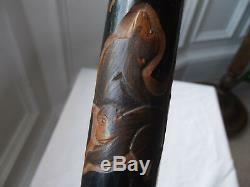 The item "Rare WW1 British & Japanese Flags Carved Bamboo Walking Stick Hidden Fishing Rod" is in sale since Friday, January 18, 2019. 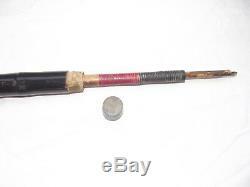 This item is in the category "Collectables\Militaria\World War I (1914-1918)\Other World War I Militaria". The seller is "daveywavy" and is located in Peebles, Borders. This item can be shipped to United Kingdom, Austria, Belgium, Bulgaria, Croatia, Cyprus, Czech republic, Denmark, Estonia, Finland, France, Germany, Greece, Hungary, Ireland, Italy, Latvia, Lithuania, Luxembourg, Malta, Netherlands, Poland, Portugal, Romania, Slovakia, Slovenia, Spain, Sweden, Australia, United States, Canada, Brazil, Japan, New Zealand, China, Israel, Hong Kong, Norway, Indonesia, Malaysia, Mexico, Singapore, South Korea, Switzerland, Taiwan, Thailand, Chile.